Follow us in a walk to live a story really happened during the age of Serenissima not as spectator, but as a protagonist. Discover those less known facts, legends and spots of Venice with professional actors! Explore the city and Its trasures far from the crowd, with a thrilling experience. 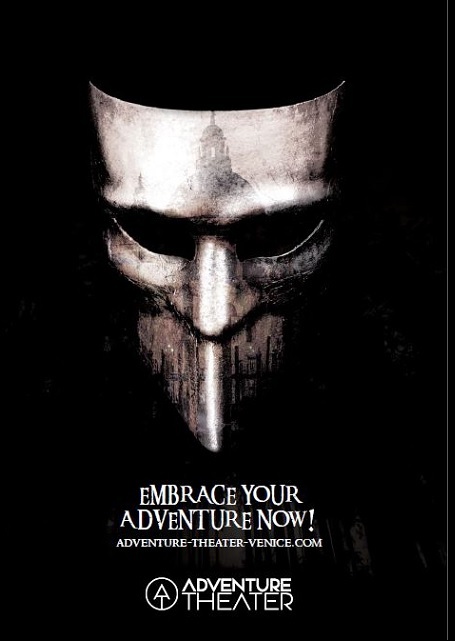 Adventure Theater is available every day, only with a reservation, in english or italian. Tour Starts at Campiello delle Scuole, in Calle Ghetto Vecchio. From the train station: Take direction to San Marco following Rio Terà Lista di Spagna untill Guglie’s Bridge. Pass the bridge and turn LEFT in Fondamenta di Cannaregio. Walk untill GAM GAM restaurant and turn right in Calle Ghetto Vecchio. Walk 15 meters and you are at the meeting point! From Guglie Ferry Station: exit the station and turn right in Fondamenta Cannaregio. Walk untill you find GAM GAM restaurant on your left. Take Calle Ghetto Vecchio and walk 15 more meters to Campiello delle Scuole. From San Marcuola Ferry Station, exit the station and reach the main street Rio Terà San Leonardo. Turn left in direction of the train station. Turn right before Guglie’s Bridge and take Fondamenta Cannaregio. Walk untill GAM GAM restaurant and turn right in Calle Ghetto Vecchio. Walk 15 meters and you are at the meeting point! From Strada Nuova\Rio Terà San Leonardo, walk in the direction of thr train station. Turn right before Guglie’s Bridge and take Fondamenta Cannaregio. Campiello delle Scuole is in Calle Ghetto Vecchio, on the corner of Gam Gam restaurant. Lido Santa Maria Elisabetta, Accademia Actv , Mestre Piazzale Cialdini Via Lazzari 32, Aeroporto Marco Polo, ufficio IAT area arrivi, Dolo via Mazzini 108 –Sottomarina viale Europa 2/c. In english at 4.00pm Thursday 28th. In english at 6.00 pm from 1st to 15th March except Wednesday 13th March the show will be at 10am. From 16th to 31st March the show will be all days at 5.00 pm. In italian at 10.00 am all day from 25th to 30th April. In english at 6.00 pm Monday 1st, Tuesday 2nd, Thursday 4th, Friday 5th, saturday 6th, Sunday 7th, Monday 8th, Tuesday 9th, Thursday 11th, Friday 12th, Saturday 13th, Sunday 14th, Monday 15th. At 10.00 am Wednseday 3rd, 10th and 17th. At 6.30 pm Tuesday 16th, Friday 19th, Sunday 21st, Monday 22nd, Tuesday 23rd, Wednseday 24th, Thursday 25th, Friday 26th, Saturday 27th, Sunday 28th, Monday 29th and Tuesday 30. In italian at 12.00 am only Wednesday 1st. In english at 7.00 pm all days only Wednesday 1st, 8th and 22nd May the show will be at 10.00 am. In english at 7.00 pm all days.